If the bin access is obstructed, collection will need to be rescheduled and may be subject to additional charges. Bins are considered overflowing if there is waste material visible above the rim. Overflowing bins may result in additional pickups and additional charges. Please call the Waste Management Customer Support Centre at 780-496-5698, or your area field inspectors. Please give us 24 to 48 hours notice before you need the extra pickup. This is the approximate time needed to reschedule a truck for your area. 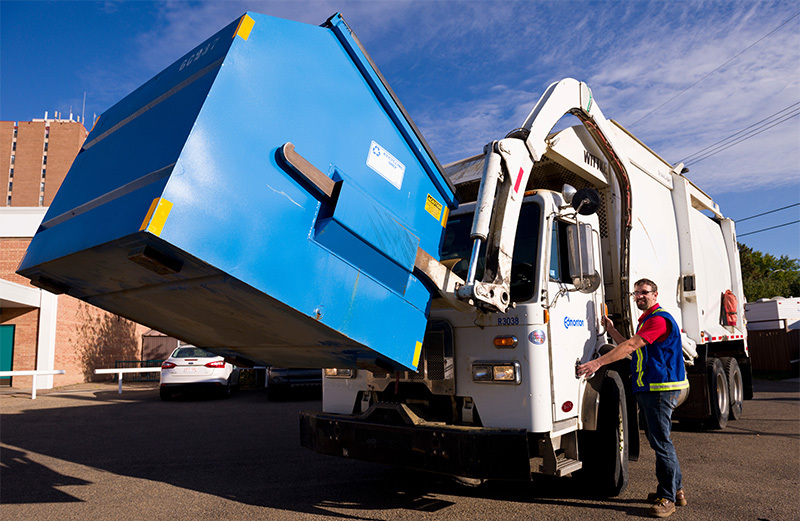 Please call the Waste Management Customer Support Centre at 780-496-5698, or your area field inspectors. Educate your tenants: Find resources such as signage for common areas, information to orient new tenants, and more in our Educational Resources. Reduce Junk Mail: Place a recycling bin next to your mailboxes and/or provide tenants with no junk mail stickers. Convenient Recycling: Place recycling and garbage bins next to each other and ensure tenants have equal access to both. Go Bagless: Leave grass clippings on the lawn when mowing or naturalize your landscaping to reduce grass waste. Learn what items belong in the recycling bin. Discover which items should be taken to an Eco Station. See these images on how to set out your waste in your recycling and garbage bins.